Why pay ten dollars for a pair of tweezers? That’s a good question, and one I continue to ask myself after trying Sally Hansen’s “Easy Tweezy” slant tip tweezer (SKU #81036), part of their Eye Care selection. If your brows are in need of plucking, this is not a product I’d recommend. The Sally Hansen Easy Tweezys. Sally Hansen advertizes their Easy Tweezy tweezer as “perfect for working in-between or above the brows…[the] platform design inside the tips means even more hair-grabbing capability” (sallyhansen.com). For the 81035 design, they added an orange padded grip on either side for “control and comfort.” At about 4 inches long, the tweezers are bigger than the ones I usually use. They come complete with a plastic “safety cap” and are sold for around $9-10.00 at drug and department stores. My mother bought the tweezers for herself. She liked that the shape of the tweezers fit well in her hand, as opposed to smaller sizes, and that the tweezers had a grip so that her fingers wouldn’t slip. Other reviewers liked the grip, too—its orange color makes it easy to find your Easy Tweezys in the bottom of your makeup bag. The safety cap isn’t a bad idea, either, to avoid pricking yourself on the pointed end of the tip. But that’s where the usefulness of this product ends. 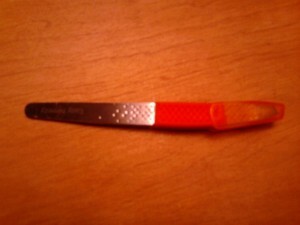 When it comes to actually tweezing, these Sally Hansen slant-tips fall far short of their advertised “workhorse” status. My mother noticed this quickly after her purchase. “They won’t grab my hairs,” she complained. The slant-tip and rubber grip. I asked to try them. It was pretty difficult to pluck with the Easy Tweezys, especially while using the flat side. I had more success with the pointed end, but it kept poking my skin, which hurt. If I had wanted to give my brows a complete cleaning, I would have been there for quite a while. At least my hand was comfortable on the grip. I tried to give the tweezers back to her, but she shook her head. Well, I don’t, either. 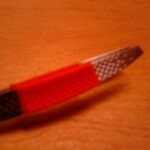 The Sally Hansen Eye Care Easy Tweezy slant-tip tweezer 81035 fails to please because it fails to tweeze. I tend to prefer splinter tweezers (I own a Revlon model that I love), but even if you like slant-tips, I would buy somewhere else. Ten dollars is too steep a price for a product that works like one you could get for $1.25.